With the recent rise in nostalgia for all things nineties, I can’t help but feel like Hollywood is having a field day. We already have a new Point Break and Jurassic Park on the horizon, and I’m sure that as long as the concept of a ‘nineties kid’ continues to propagate, there’ll be plenty more remakes and sequels to follow. As things stand, films that would have been destined for the direct-to-video aisle only five years ago can now find life on the big screen, and people will support them wholeheartedly, bound by a constructed notion of the nineties and all that the decade represents. Nostalgia has now become an industry unto itself, one that’s all-too aware of how people’s emotional connections to the past will justify lazy and half-baked products. 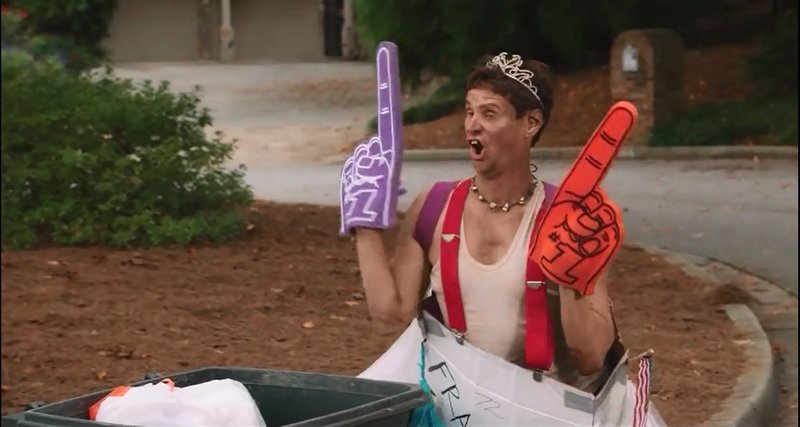 Case in point: the Farrelly brothers’ Dumb and Dumber To. The sequel to their beloved 90’s comedy Dumb and Dumber, the Farrelly’s latest outing was received with widespread commercial success last year, despite being one of the laziest films of the last decade. I find it hard not to be cynical when approaching Dumb and Dumber To. The film’s opening makes a point of systematically revisiting characters and jokes from the first film, and the closing credits are similarly composed of nothing but stills from the series’ past, backed by painfully twee music. It seems infatuated with its own history, to the point at which it doesn’t seem keen on writing any of its own. 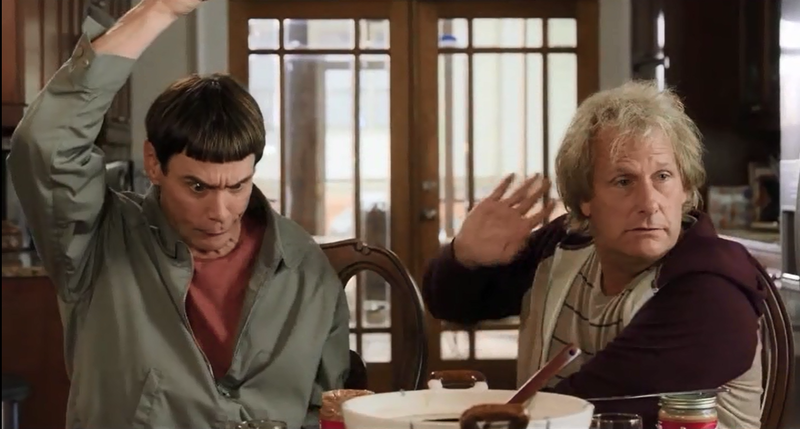 Whereas the first Dumb and Dumber made its name on its darkly-pitched gross-out comedy, this new outing seems to be nothing but a feature-length compilation of fart jokes, interrupted by frequent call-backs to its twenty year-old predecessor. There’s a workmanlike quality to Dumb and Dumber To: from the dull locations to the duller production and composition, it feels like a film made expressly as a commodity; rushed in time to take advantage of a burgeoning nostalgia market. When our protagonists arrive at their third indistinguishable road-side to make jokes about how much technology/culture/insert reference has changed since the 90’s in a characteristically static back-and-forth, you have to wonder if anyone behind the camera really cared. If there’s one nice thing to be said, it’s that Jim Carrey and Jeff Daniels slip back into their lead characters admirably, even if lazy writing has doomed them to failure. Carrey can still rubberface with the best of them, and Daniels still knows how to dial things back enough to provide a counterpoint to Carrey’s hyperactive bounding .Unfortunately, even this suffers: the madcap slapstick that their performance is indebted to—that of Laurel and Hardy or the Three Stooges—falls flat; too often obscured by the decisions made in post-production, like hammy special effects and an edit that favours long and predictable set-ups. With every flubbed line: every borderline-sexist or racist remark made to play to the cheap-seats, and every overcut and overproduced pratfall, it becomes clear that little love or attention went into this film. Of course, movies like this are inevitable. Hollywood will always endeavour to make the easy buck, and a cash-in of this scale is nothing new. Dumb and Dumber To feels oddly insidious, though, if just because of the lengths it goes to in order to insult its viewer’s intelligence. ‘Dumb’ comedy done right should feel like a gut-punch, like the rapid-fire idiocy of a film like Jackass: The Movie, or the sudden surreal beats of a Naked Gun or a Kung Fu Hustle. Dumb and Dumber To, on the other hand, feels like a colonoscopy: there’s little sense of the unexpected, but it instead lingers on every awkward set-up and telegraphed fall with unnatural silence and unease; as if waiting for its audience to respond. They won’t. Revisiting the original Dumb and Dumber, it becomes clear that the Farrelly brothers were given a free pass in the 90’s. A lot of the series’ humour is endemic to a time and a place in the American psyche, contingent on the imagined reactions of a conservative middle-America more so than the quality of the jokes themselves. The Dumb and Dumber series is, like Marilyn Manson or MTV, a reaction rather than a statement, and unfortunately for the Farrelly brothers, the specific brand of conservative America that Dumb and Dumber reacts to lost its cultural foothold long ago. What we’re left with is a film full of cheap gags, targeted at an audience twenty years too late to the party, and yet who’re still willing to sit through the whole thing if just because they believe, somehow, that the sequel to a twenty year-old film will still be able to capture the specific magic of a time and place long gone. In the end, Dumb and Dumber To is like a scratch-card, or an unsolicited email from Burkina Faso: a blunt-edged product that trades in people’s blind wants and fixations, and yet offers nothing in return. This entry was posted in Films and tagged 90s, comedy, Dumb and Dumber, Dumb and Dumber To, Farrelly brothers, Jeff Daniels, Jim Carrey, Nostalgia. Bookmark the permalink.